Until I bought this novel, my knowledge of Serbian writer Zoran Živković’s fiction was non-existent. The descriptions of a huge SF fan producing witty pieces of Borgian surrealist fiction appealed, so I thought I’d give one of his novels a go. Escher’s Loops, fortunately, doesn’t disappoint on any of these levels. The narrative is unconventional, being made up of a number of smaller stories, all of which interlock to produce the novel – hence the title. The novel is split into four sections, which tell the stories in a number of different ways, so the first “Loop” is the a number of tales relating to something inexplicable or odd. So it starts with a surgeon who freezes in surgery and the stories throughout this loop all move towards ending with this situation and character by having the main character in each tale freeze at an awkward moment. This structure is repeated throughout the remainder of the novel and the remaining three loops. Some of the stories are, in effect, repeated, though from a different perspective, and in a different way (moving through people stuck in confined places to a woman encountering a series of people contemplating suicide to dreamers). This drive for precision within the novel, perhaps, sounds a little like it would be a dry, academic, exercise. Admittedly I’m not averse to these kinds literary experiments, but it was oddly compelling. If, I suspect, not to all tastes. The stories that make up the whole of this novel are, for the most part, short and don’t waste words. Though, as the novel moves on and extra detail is added to each of the tales from a different perspective (and in a different style) depth is added to each. That the prose is sparse, however, does ensure that the reader is always able to follow the narrative (such as it is) throughout. The reintroduction of a tale is never done in a heavy-handed, or obvious way. “The waiter decided at first to leave the profession, even though he had talent that promised a successful career. It took the restaurant owner a long time to make him change his mind. It was only when the owner gave him a raise and promised to ban birds from the restaurant that he accepted. The waiter had no reason to disillusion his colleagues and the maitre d’. Let them think the old trauma was behind the whole thing. They wouldn’t have had much understanding for his unseemly conduct if they knew what had really caused it. The memory that resurged as he was waiting for the guests to make up their minds was not stirred by the feathers on the pink had because they weren’t ostrich feathers. He never did figure out what had called forth that event of six years and seven months ago which had lain dormant for so long. This way of ending one tale and moving to the next is replicated throughout the novel, though, depending on the section, it may be through further recollection, or by one character offering to tell another a story. Something to be aware of is that, while there is certainly plenty of incident within the novel, nothing actually happens. This might seem contradictory, and it is. What I mean is that the non-linearity of the novel and the lack of real resolution to any of the stories told, means that you can’t expect to find out what happened at the end. There is never an end (not a spoiler, the whole premise of the novel would be lost if you had a beginning-middle-end structure!) For this reason, though, I would urge some caution when choosing whether to read this. Once again, I rather suspect that this will not be palatable to all readers. 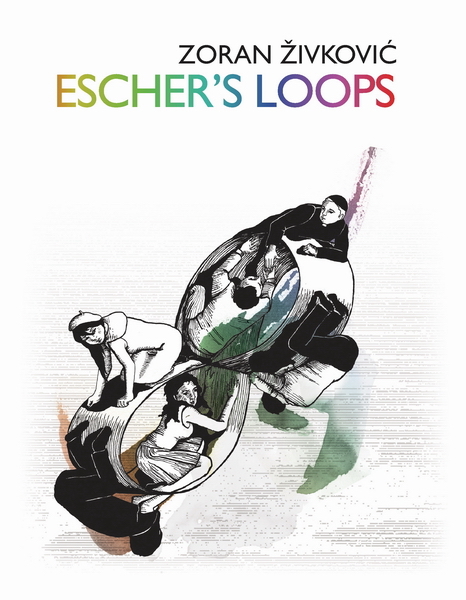 The absurdity of many of the situations provides a welcome dose of humour to Escher’s Loops. Had that not been there, I suspect that what Živković would have produced would have been an interesting work, yes, but a far less entertaining read. It’s probably testament to the quality of the translation, too, that the wit in the writing makes it into English intact, too. One thing that you definitely won’t get from this novel is well-rounded characterisation, or a sense of place. None of the characters have names, instead being described by their occupation. The individual stories have no wider setting than the immediate area that the characters inhabit. So, if they are talking about events taking place in a kitchen, that is the only place referred to. There is no wider sense of where the action is taking place. From that point of view, I suppose, that one could describe it as being truly “world” literature. It doesn’t attempt to describe any one place or culture. This lack of place probably helps with the humour in the novel; not all humour translates well and the lack of geographical and cultural context to most of this removes the need for the reader to understand any of the background to the more humourous sequences in the novel. I thoroughly enjoyed this and, with the caveats noted above (it’s probably not something that everybody will find satisfying to read), recommend it highly. The first of Živković’s novels that I’ve read, it certainly won’t be the last. Great stuff. This entry was posted in Review and tagged absurd, novel, serbia, Zoran Živković. Bookmark the permalink.